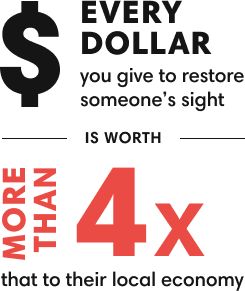 The economic impact of restoring sight is significant. Your donation affects more than one life. Find out how. Read about the people whose lives have changed thanks to our generous donors. Blindness to the disease leads to a worse blindness. Clerence has suffered from diabetes since she was a baby. One of the many complications is diabetic eye disease. Fearful, helpless, hurting… then a 20-minute operation gave him his sight back and his life.